During the days of Massasoit, sachem (chief) of the Wampanoag, the tribe occupied the lands from the eastern side of Narragansett Bay to Cape Cod, including Martha`s Vineyard and Nantucket. Massasoit had cultivated harmonious relations with the colonists, being especially helpful to the Pilgrims in their early travails, but tribal lands diminished sharply as the colonists expanded. In 1662, Metacom, a son of Massasoit and known to the colonists as King Philip, became sachem. The Wampanoags` dependence upon English manufactured goods led them into ever-increasing land sales, resulting in further resentment and tension. In 1675, three tribal members were tried and executed by the English for the murder of a converted Wampanoag, touching off more than a year of hostilities. Beginning in June 1675, the Wampanoag, outfitted with rifles and armor, attacked a series of settlements and took the lives of dozens of colonial men, women and children. English forces retaliated in kind by destroying native villages and slaughtering the inhabitants. Soon other tribes, including the Narragansett, joined the fray and the entire region fell into conflict. 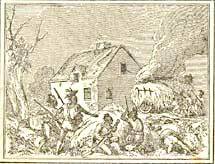 The tide turned in April 1676, when the Narragansett were decisively defeated and their chief killed. Hostilities ground to a halt a few months later when Philip was betrayed, captured and killed. His corpse was drawn and quartered and his severed head placed on a stake to be paraded through Plymouth Colony. Philip`s son was sold into slavery in Bermuda and many other captives were forced into servitude in homes throughout New England. Also suffering tremendously during the conflict were the so-called "Praying Indians," who had been converted to Christianity, but were distrusted by both sides. The colonists prevailed in King Philip`s War, but the cost was tremendous. It would be more than two decades before all of the devastated frontier settlements could be reoccupied, and longer still before they began further expansion in the West. The New England Native Americans had been decimated to the extent that their impact on future events would be almost nonexistent. The Name of War: King Philip's War and the Origins of American Identity by Jill Lepore. Narrative of the Captivity and Restoration of Mrs. Mary Rowlandson by Mary Rowlandson.